With a multiple zone wine refrigerator you can store your different types of wines in 2, 3 or more independently controlled temperature zones. Multi-temperature zone wine coolers are high-end wine storage solutions that ensure perfect thermal and other conditions for your wines. Several manufacturers – EuroCave, Perlick, Marvel, Vinotemp – make multi zone wine refrigerators in various decors so that you can choose one that best suits your needs and preferences. Dual zone wine coolers have two distinct temperature zones one for red wines and the other for whites. You can adjust and monitor the temperatures of the two zones independently. For more information read our article about dual temp.-zone wine cooler refrigerators that recommends some good-value two-zone wine fridges. 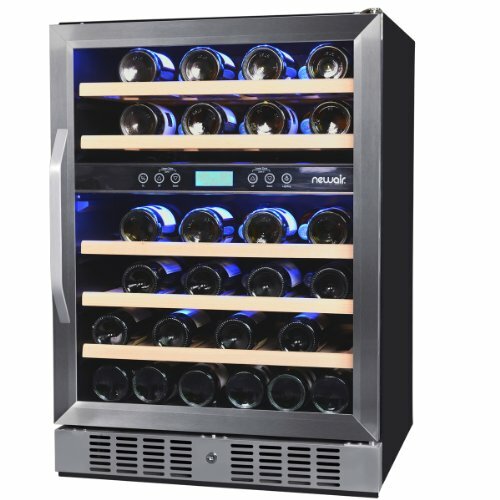 On this page we list and review the most popular multiple zone wine coolers with 3 or more independent temperature zones. Note that some wine cooler brands appear to have 3 zones, while in reality these are not 3 separate, individually climatized compartments within the unit but 3 temperature levels in the interior of the cabinet, the temperatures of which you cannot adjust separately. These are in fact single zone wine refrigerators in which you can select and adjust one temperature to which the unit will cool. U-Line wine coolerrs are a good example of this. 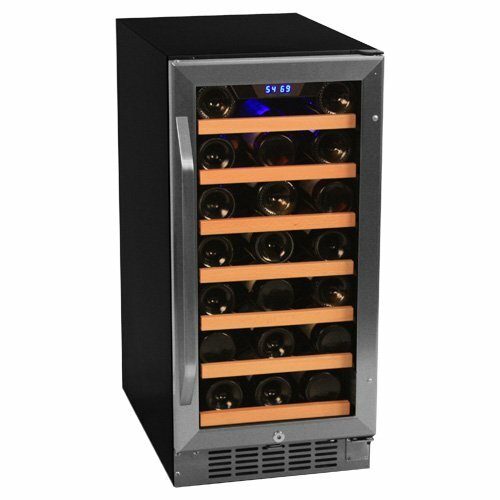 U-line however has true dual-zone wine coolers with two independently controlled drawers. Read more about U-Line Echelon Two-Zone wine refrigerator. Besides inexpensive wine coolers Vinotemp offers some elegant, artfully made furniture style wine cabinets with two, three or four temperature zones. This triple-zone wine cellar by Vinotemp has 3 independent temperature zones each with 20 bottles capacity. Each compartment has its own door reducing unnecessary escape of cold air (you only open the door of the compartment when you want to acess to the wines in it) and control panel for adjusting the required cooling temperature. The Vinotemp Bordeaux 3-zone wine tower is a slim unit that takes up little space and looks great in a living room or recreation room corner. The stylish wood exterior with the warm finish makes it a nice addition to any home furnishing. The VT-BORDEAUX3 is for freestanding use only. 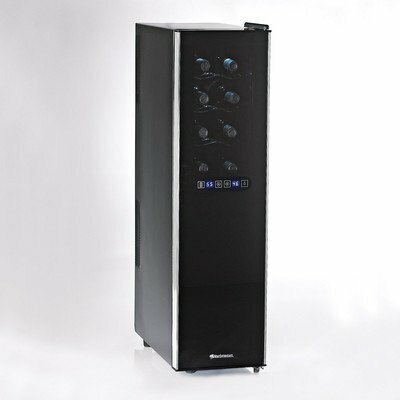 The slightly tinted door glass filters out harmful UV light yet it provides a nice view of your wine collection. The soft interior lighting in each compartment enhances the wine display. 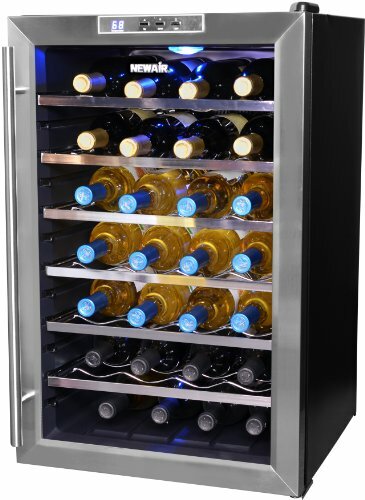 Since the Vinotemp VT-BORDEAUX3 is a rather capacious 60-bottle wine cooler, for efficient cooling it is equipped with a hybrid cooling system: silent and vibration-free thermoelectric cooling and a compressor with eco-friendly coolant. Well-made metal shelves with wood trim accommodate the wine bottles in each of the 3 zones. The shelves can be pulled out for better access of your wines. There are reliable knob controls for adjusting the temperature in the three zones. TIP: combine it with a left side unit of the same model and you’ll get a full-width wine cellar. Price of the Vinotemp Bordeaux 3-zone Wine Cellar, VT-BORDEAUX3: US$ 1 100 -1 700. The Vinotemp Rioja 4-Zone Wine Cooler can accommodate up to 84 bottles of wine in 4 independent temperature zones (each zone stores 21 bottles). Each of the four compartments has 7 pull-out wire shelves. The VT-RIOJA4 is a very attractive furniture-like wine cellar that your guests will stop to admire. The wood exterior has a rich dark brown finish. The decorative handles and the sculpted motifs on each tinted dual pane glass window land classic elegance to the Vinotemp VT-Rioja4 wine wood wine cellar. Similarly to the 3-zone Vinotemp Bordeaux model described above he Vinotemp VT-Rioja4 also has hybrid cooling technology ensuring silent operation without vibration. All 4 cooling zones have their own temperature controls with which you can conveniently set and monitor the temperature. Price: US$ 2 500-2 800. The French-based EuroCave is known for its high-quality wine refrigerators that efficiently replicate conditions existing in natural wine cellars. Eurocave has a versatile product range including 3-zone and Multiple-Zone Wine Cabinets. Bottom Zone: Serving compartment: chills whites, sparkling wine and champagne to 40ºF – 44ºF. A larger capacity 3-Zone model by EuroCave is the E283 model that can hold up to 192 bottles of wine. TIP: The EuroCave Compact Range Wine Cabinets also includes multiple zone models with max. capacities ranging from 53 to 164 bottles. Find out more about the characteristics and main features of EuroCave Wine Cabinets. 72-inch (max. 138 bottles) wide undercounter models for built-in instalaltion. 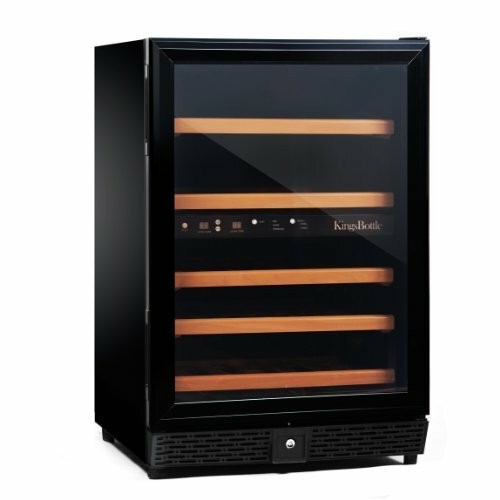 These professional refrigerated wine cabinets are perfect for commercial use in hotels, restaurants or bars. Not only the exterior of the cabinets is high-quality stainless steel but the interior is also commercial grade stainless steel. A unique technical feature is the Variable Speed Compressor – it cycles only when it’s necessary to maintain the adjusted cooling temp. – it saves electricity and ensures longer life of the compressor. the third compartment for reds. Each zone has its own control for setting the temperature and LED readout. Read more about the 3-temperature zone Perlick wine cellar. See other commercial wine cooler refrigerators. The Australia-based Transtherm/Vintec company is a renowned manufacturer of high-quality home cellars that are ideal for long term storage or ageing. The smallest multi-temp. unit is the MAS model with 55-66 bottles capacity. The medium size Cellier model stores up to 140 bottles while the largest unit Reserve has space for max. 180 bottles. Find out more about Transtherm wine cabinets. Liebherr, the German refrigerator manufacturer, has multi-temperature zone wine cabinets that have 6 zones. Read an overview of Liebherr wine cabinets. N’FINITY 340-Bottle Wine Cellar – two NFINITY 170-bottle models are bolted together to make a large home cellar. Each side has two zones.